When referring to 'place a worker onto the tile', this refers to the first use of the tile. Subsequent uses will require more workers as explained in the 'production' section. There are four turn order tiles. Depending on the number of players, some of these tiles may not be in use during the game. The side of the tile used will also depend on the number of players. The black worker icons at the top of the tiles indicate in which games the tile is used and which side of the tile is visible. The number in the box indicates in which order the players will select the contents of the boats in spring summer and autumn and in which order they will select a boat to place into their village at the end of winter. The purple worker icon indicates who the start player will be in the following season: summer, autumn or winter and the player who wins the bidding for that tile takes the start player marker. At the end of winter the player winning the tile depicting the purple start player worker also takes the purple start player worker. In the winter it is possible for a player to win more than one of the turn order tiles and these are placed into their village. In the game end scoring the owner of each tile gets 1 point for each other tile that the turn order tile is connected to. Note that unless the player also owns summer boat 2a, all the sides must match: roads, no roads, water. However a player does not have to connect the boat(s) to the water side of their home tile if they do not wish to. The advantage in their doing so arises only if they own the Sea Breese boat tile. Each player will receive one boat at the end of winter. 1 point for each of the player's transport capacity. (This total can be doubled if the player also owns the summer boat 2b). 1 point for each tile which is connected by roads as part of a loop which connects back to the starting point without the traveller having to travel along the same route twice. Points as indicated for each boat (including the summer boats) that connects by river to the home tile. Players should avoid placing tiles with roads which may prevent boat tiles being connected to the home tile (unless they have boat 2a). Boat tiles do not have to be placed so that the water sides are connected, but will not score points for the Sea Breese if they are not. The player may flip one tile in their home village without having to pay the upgrade cost. In addition they score 2 points. 1 point for each worker the player has at the end of the game. These will be workers that have been used in the player's own village in winter and workers that the player did not use in winter. Note that each worker can only be scored once. If the worker is already being scored by the apothecary, craftsman's guild, Key market or village hall, it cannot also be scored by the White Wind. The summer boat tiles have a season icon on both sides so either side can be the face up side for the game. The side is chosen at random when the summer tiles are introduced. The tile is never upgraded or flipped over. When in a player's village the tile gives that player a unique ability. The player does not need to place a worker on the tile in order to have the ability, indeed no workers may be placed on the summer boat tiles. The abilities conveyed by the boats cannot be acquired by other players. When taking workers from the boats at the end of summer and autumn, the player takes two additional workers from the bag if available. When taking a boat tile at the end of winter, the player takes two workers from the bag. Note these are the only new workers that any player will receive at the end of winter. The workers are drawn from the bag after all of the workers (including green workers) used in winning bids in that round have been placed in the bag. When taking workers from the boats at the end of summer and autumn, the player additionally takes one green worker from the supply if available. When taking a boat tile at the end of winter, the player also takes one green worker from the supply if available. Note this is the only new worker that any player will receive at the end of winter. When transporting resources the resources may be transported across fields (where there are no roads) as well as along roads. In addition, when placing village tiles in their village a player does not need to match the sides (roads, no roads and water). This ability does not affect the Sea Bastion boat which requires roads to be connected in a loop in order to score points. All of a players transport capacity and upgrade ability is doubled. 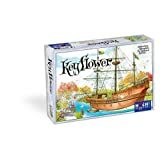 If a player has the Keyflower boat at the end of the game, the Keyflower scoring is doubled. When upgrading any type of resource: gold, iron, stone and wood can be used in substitution for any other type of resource. For game end scoring purposes, gold, iron, stone and wood can be counted in substitution for any other type of resource. If another player has bid for a village tile using blue, red or yellow (but not green) workers, then the owner of this boat may counter bid using a different color (including green). However all of the workers used in the counter bid must be of the same color. When breaking the same color rule in this way, the workers are placed lying horizontal for ease of identification. If all of the other players' workers (the players who had been bid against) are moved elsewhere because they have been outbid and there are no workers using the tile being bid for, then the workers that are lying horizontal are stood up and their color becomes the new bid and usage color for that tile. If a tile has already been bid for, or has previously been used for production, the owner of boat 4b does not have to follow the same color rule (even if green workers have been used) when placing workers on the tile for production. They may alternatively use any colored workers, including more than one different color at the same time. When breaking the same color rule in this way, any workers that do not follow the original color used are placed lying horizontal, for ease of identification. The horizontal workers still count toward the six worker limit for workers using a single tile. Other players must continue to use the color of the standing up workers when using or bidding for the tiles that contain the horizontal workers. If a tile has not previously been used or bid for, then this does not apply - the player must place their workers standing up in the usual way and, if more than one, they must be of the same color as each other. A player places a worker on this tile and then draws the indicated number of workers from the bag, if available, and places these behind their screen. A player places a worker on this tile and then takes a skill tile (or tiles if the apprentice hall had been upgraded) at random from the pile of facedown skill tiles and places this behind their screen. The owner of the tile will score points for each resource of the type shown, which is on that tile at the end of winter. (Any resources scored in this way cannot also be used for scoring in conjunction with the jeweller, mercer's guild, watermill and windmill tiles). A player places a worker on this tile and then places a skill tile of any type face down in the pile of skill tiles. The player then draws the indicated number of workers from the bag, if available, and places these behind their screen. A player places a worker on this tile and then places a skill tile of the type shown face down in the pile of skill tiles. The player then takes the resources indicated from the stock, if available. The resources are placed on this tile if the tile used is in the player's own village. The resources are placed on the player's home tile if the tile used is in another player's village. A player places a worker on this tile and then places an additional worker in the bag of the color indicated. The player then takes the indicated number of green workers from the stock, if available. No green workers can be taken from the bag if there are insufficient remaining in the stock of green workers. When a worker is placed on one of these tiles (in any player's village), the player may transport resources in their own village and upgrade buildings in their own village. The player may move up to the number of resources indicated by the cart and upgrade up to the number of village tiles indicated by the upgrade icons (one or two). The transportation of resources must be along roads. The number of resources indicated on the transport tile can be split between one or more resources of the same or different types. For example if the transport capacity is two, then two resources can be moved to an adjacent tile(s) or one resource can be moved two tiles. These tiles only generate points at the end of the game. A player places a worker on this tile then takes the resources indicated from the stock, if available. Any resources generated in a player's own village are placed on the tile generating the resources. Any resources generated in another player's village or from a tile being bid for are placed on the player's home tile. A player places a worker on this tile and then places a skill tile of any type face down next to the pile of skill tiles. The player then takes two (or three if the hiring fair tile has been upgraded) skill tiles at random from the pile of face down skill tiles and places these tiles behind their screen. The skill tile they played is then mixed in with the remaining skill tiles in the pile. A player places a worker on this tile and then discards an additional worker. The player then draws the indicated number of workers from the bag, if available, and places these behind their screen. After the workers have been drawn, the discarded worker is placed in the bag. The discarded worker cannot be used to make up any shortfall of workers in the bag. if this tile is not upgraded, a player places a worker on this tile then takes one of the three resources indicated from the stock, if available. If this tile has been upgraded, a player places a worker on this tile then takes all three of the resources indicated from the stock, if available. Any resources generated in a player's own village are placed on the tile generating the resources. Any resources generated in another player's village or from a tile being bid for are placed on the player's home tile. The owner gets 3 points for every 5 workers (including green) that they own at the end of the game. Note this includes workers which were played into the player's own village in winter. The owner gets 3 points for each set of blue, red and yellow workers that they own at the end of the game. Note this includes workers which were played into the player's own village in winter. Note also that green workers cannot be used in substitution for one of the other color of workers. The owner gets 2 points for every gold resource they own at the end of the game instead of the usual 1 point. The owner gets 10 points for every 5 skill tiles the player possesses at the end of the game. The owner scores 12 points. The owner scores 2 points for each green worker which they own at the end of the game. The owner gets 5 points for each set of three different resources the player owns at the end of the game. Note that gold can be used in substitution of any of the other types of resource, but if it is used in this way the gold does not then also score 1 point for being gold. The owner selects one type of skill tile which they possess. The owner gets 3 points for each skill tile of that type that the player possesses at the end of the game. The owner gets 10 points for each set of three different skill tiles the player possesses at the end of the game. The owner selects one color of worker which they own. The player gets 1 point for each worker of that color that the player has at the end of the game. Note this includes workers which were played into the player's own village in winter. The owner selects one type of resource which they own. The player gets 1 point for each resources of that type that the player has at the end of the game. Note there is no point in the player choosing gold as gold already scores 1 point at the end of the game and cannot be scored twice. The owner gets 5 points for every 5 resources of any type that the player has at the end of the game.